Hello. 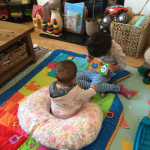 We are looking for a live out nanny to care for our one year old daughter during the day, and our eldest daughter after school on Tuesday's, Thursdays and Fridays starting in March 2019. Hours are negotiable. Please get in touch if this interests you, we look forward to hearing from you. 3 full days a week, hours negotiable. Prepare meals for toddler (heating up or cooking fresh), picking up second child from school (on foot), keeping them both stimulated, light house duties e.g. emptying/loading dishwasher, keeping common areas tidy, washing for daughters when needed.